It doesn't take much to notice that some people consider Chihuahuas to be fashion accessories. In the Chihuahua community, owners, breeders and enthusiasts often debate about some owners' desire to use their dogs as fashion accessories. Here are some ways in which people exhibit their Chihuahuas. Doggie purse. In other parts of the world, it's totally acceptable for owners to bring dogs into cafes and stores. Here in the United States, it's generally against the rules to do so unless otherwise posted. Some people opt to take their Chis with them in doggie purses. These medium-sized bags have a solid, flat bottom. The Chihuahua can chill out in her owner's purse and go various places. Many owners select dogs that complement their favorite colors and fashion accessories. Salon treatment. They say that dogs match their owners, but some owners take this to a different level. Some Chihuahuas receive serious salon time and pampering--included painted (pet-friendly) nails and even fur treatments at pet spas. Fashion show. Everyone's seen dog costumes, especially at Halloween. Some people dress their dogs daily and often match the dog to their own clothing. Dog reaction varies, depending on the attitude of the dog being dressed. These things are all cute when done on occasion, but celebrities like Paris Hilton have glamorized the idea of using a Chihuahua as a fashion accessory. Chihuahuas are petite and often babied due to their small size; they also make ideal companions for those wanting a companion dog. If you engage in fashion accessory behavior, it's important to pay attention to your dog's reaction. Is he happy when you fuss over him after providing the new outfit? Is he fearful when you take him out for a stroll in the doggie purse? In many instances, it depends on the dog and the activities that specific dog enjoys. Which do you think involves making the dog a fashion accessory? Which are cruel and which are cute? Please leave your comments below. Most dog owners have crates, but these are necessary devices easy to overlook when you have a Chihuahua. That's because Chis are small and portable--and most house guests are not afraid of them. However, all dogs should have crates of their own. This provides a sense of safety and security for a dog. If you find yourself traveling or relocating, many airlines will require a crate for small dogs. Selecting the appropriate crate for a Chihuahua can be difficult. It's recommended that you take your dog with you (if possible) to select a crate. Chain and main street pet stores are often pet-friendly; don't hesitate to bring your Chihuahua in and ask for help. Large enough for your full-grown Chihuahua to fit in comfortably when standing. Small enough to contain the dog. It shouldn't allow the dog enough room to jump up and down or pace. Completely enclosed for travel. Some cages simply rest over a tray, but a traveling dog will need a small, self-contained unit. Intended for dogs, not other creatures. Cages are designed with the animal in mind. Generous with the 'cage-style' front to allow for adequate ventilation. If you can't find a small-enough crate, ask for a puppy-sized crate. Many puppies of larger breeds are Chihuahua-sized when they're puppies. You should also ask your veterinarian for further recommendations, including a brand recommendation. When you bring the crate home, place your Chihuahua's toys inside of it and leave the door open. Your dog should experience the crate as a safe shelter, not an area of punishment. As puppies, Chihuahuas have floppy ears. 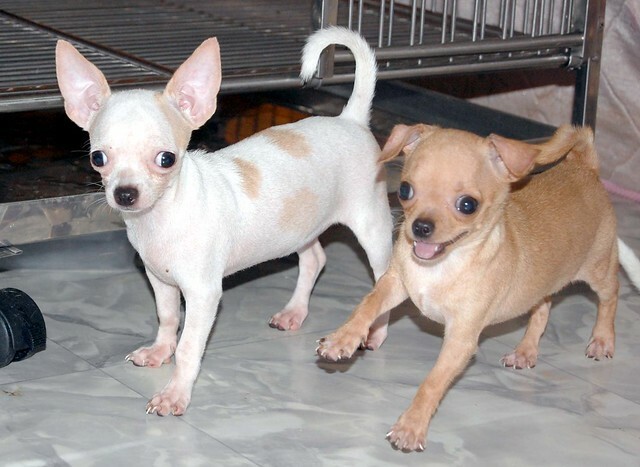 By the time they're about 10 weeks old, most purebred Chihuahuas will have those conspicuous straight, perky ears. Even though these types of ears are easier to maintain than floppy ears, they do still require cleaning and maintenance to keep your dog healthy. Since Chihuahuas are small, it's sometimes easier to damage their ears while cleaning. It's important to remember that Chihuahua ears are even smaller than our own and patience is required in ear cleaning. To clean your Chihuahua's ears, you'll need cleaning solution (obtained from your veterinarian or local pet store), cotton balls, a few tissues and a cotton swab. The procedure for cleaning a dog's ear is similar to cleaning a human's. If you own a Chihuahua mix or a dog whose ears do not remain straight up, enjoy that floppy-eared cuteness! Even show-quality Chihuahuas do not have cropped ears or tails--the ears usually stand up naturally. If your Chihuahua or Chi mix has floppy ears, avoid the pain and expense of cropping or taping and let your dog exist with the floppy ears. Floppy-eared dogs like Golden Retrievers, Boxers and Chihuahuas who develop different ears require a bit more attention from owners. Floppy-eared dogs are prone to infection more than other dogs because there is less air flow into the ear. Simply clean more frequently and check for odor. Since most Chihuahuas don't require professional grooming, owners must stay on top of ear care. Groomers often take care of ears on dogs who require frequent grooming. If your dog's ears smell, it's an indication that it's time for a cleaning. A smell can also indicate infection. If ear problems do not clear up after a few days, it's best to consult a professional: call your veterinarian. Chihuahuas usually respond pretty quickly to their medical problems--you'll notice a definite change in his behavior if there are ear problems. A dog with ear problems can become more lethargic, snappy or hesitant. 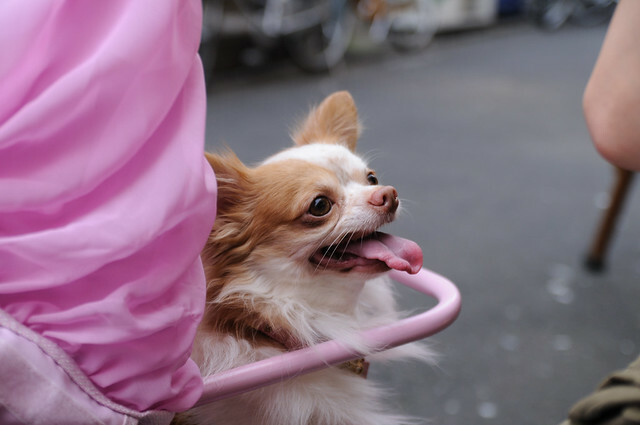 Because the Chihuahua is a small breed, some pet owners feel that it requires less training or that a Chihuahua need not be leashed. However, proper leash training could save your Chihuahua's life. 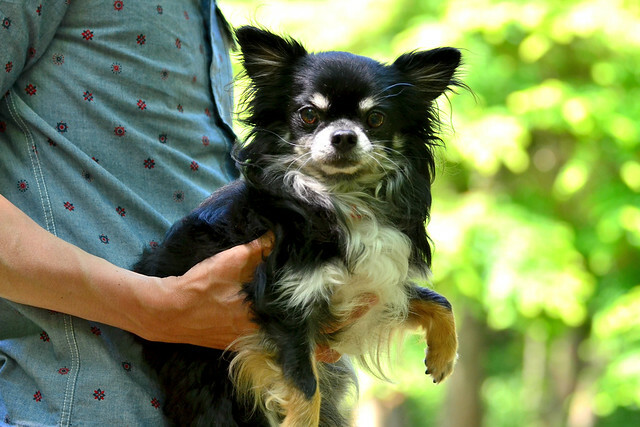 Small dogs like Chihuahuas are even more at risk for injuries. They're fragile creatures, and are unlikely to survive an aggressive dog encounter or a run-in with a car or bicycle. Dog trainers debate about what types of collars are most humane and effective for dogs. Large or muscular breeds like pit bulls may require prong collars, but little Chihuahuas are delicate. Chihuahuas are extremely sensitive to tugs and some trainers recommend avoiding 'choke' type collars altogether. If you do use a choke collar with a Chihuahua, you must be extremely sensitive with the dog. Many Chihuahuas already suffer from breathing problems such as the collapsing trachea; too hard a tug could severely injure or kill the dog. Cloth collars are recommended for Chihuahuas, but it may help to switch to a different collar when training or walking the dog. This lets your dog know it's time to get serious. Fortunately, small cloth collars are inexpensive compared to other sizes and types. Ensure that the leash is also cloth and lightweight. Control should not be a problem with a dog so small. 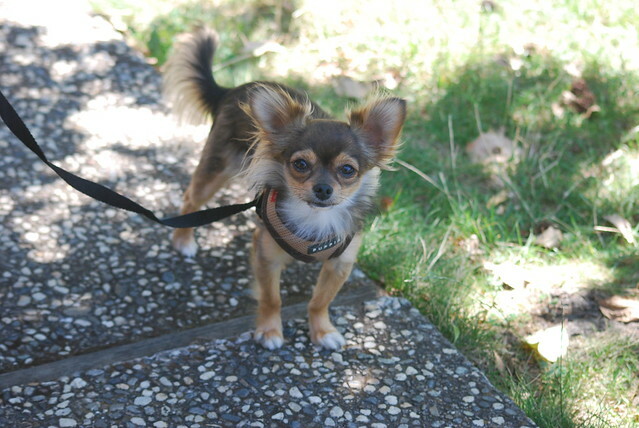 Guide the leashed Chihuahua initially by leading her in one direction with a noisy toy. Praise the dog for obeying. Practice on concrete or on a floor where the dog is less distracted by smells. Remember, a dog's primary sense is its smell. Reward the Chihuahua with a small treat after training (but avoid overfeeding). Break treats into smaller pieces if necessary. You have a major advantage working with a small dog. A dog pulling the leash gets a 'reward' for doing so if you move forward. 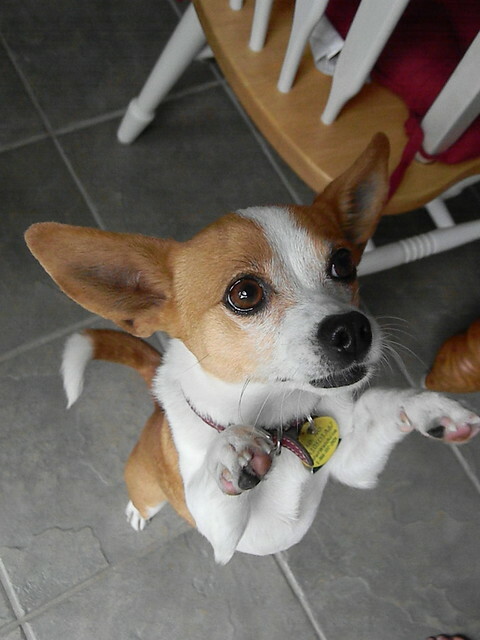 If you find that your Chihuahua does this, you can simply stop--stand your ground. This video also offers other training techniques such as click training and treating behind the heel. 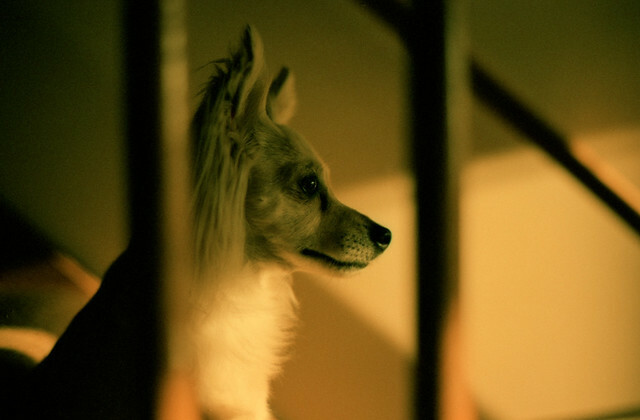 The dog trainer in the video uses an untrained Chihuahua as an example. Note how she also treats the dog for stopping when she does and that the size of the treats offered is very small. This trainer also advises using unpredictability on your walk. This helps your Chihuahua look to you as the leader. 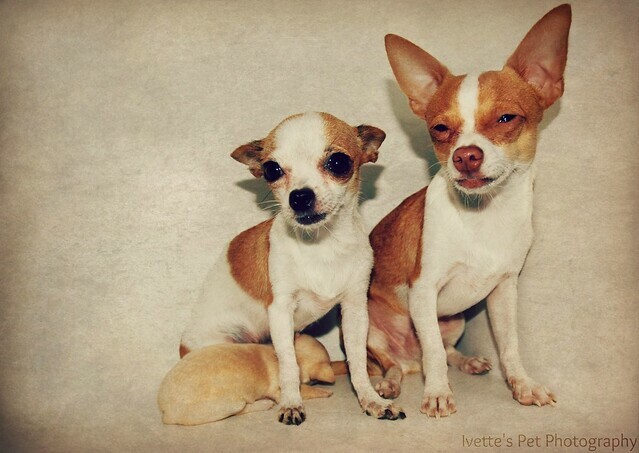 Older Chihuahuas can tire easily, and small dogs sometimes have a hard time keeping a fast pace. Make sure to bring water on your walks and be ready to carry your Chihuahua if he gets tired. Note: Consult your dog's veterinarian or a professional pet trainer before you begin training. Chihuahuas and other small dogs frequently experience dental issues. Dogs go through four stages of dental decay and even well-cared for Chihuahuas need routine vet visits and dental checkups. Florida Chihuahua owner Melanie B. recently discovered that her 10 year old dog Rosie started having dental issues. She learned this at a routine trip to the vet. 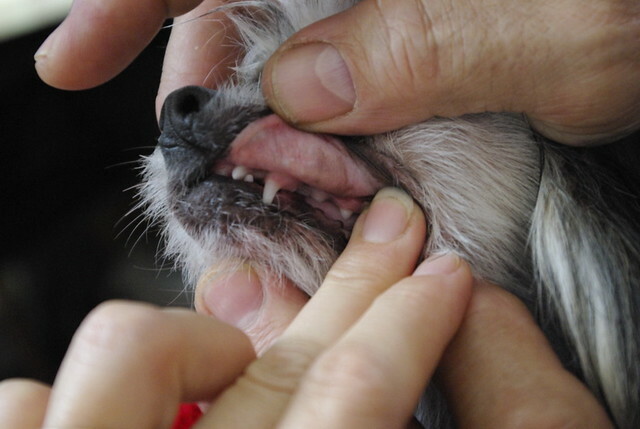 "The vet said she has a lot of tartar on her teeth and that little dogs' teeth can go bad quickly," Melanie said. The treatment was to anesthetize Rosie and while her teeth were cleaned. Like many dogs, Rosie gets snappy and uncomfortable when strangers go near her mouth. "For after-care, he gave us toothpaste and a toothbrush that you put on your finger," Melanie explained, also noting that it's difficult to brush Rosie's teeth because of the Chihuahua's small size. 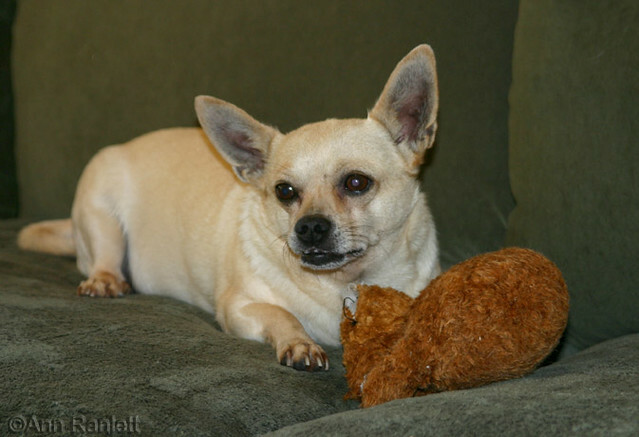 Chihuahua dental care is something Chihuahua owners should consider saving for. Each thorough cleaning or procedure can cost hundreds of dollars. "We bought the pet plan, but it was around $220," Melanie said. While all dogs need dental cleaning, you can minimize your Chihuahua's risk for major dental problems. At-home brushing: Let your dog lick and smell the toothbrush and dog toothpaste. Get her used to your hands in and near her mouth before brushing. Balanced diet: Too much human food, sweets and treats can be bad for a Chihuahua's teeth. Consult your vet to determine the best type of food for your dog's dietary needs and dental health. Wellness visits: Like people, pets should go to the vet at least once a year when they're healthy. During this visit, your dog's vet will examine his teeth. While many professional dog trainers advise against allowing pets on furniture, some Chihuahua owners ignore this rule. Chihuahuas, after all, are small and cuddly lap dogs bereft of large teeth and claws, making it less likely that they'll disturb people or damage furniture. However, constant jumping can cause major back problems in your happy and healthy Chihuahua. Because they're small, Chis are susceptible to Intervertebral Disc Disease (IDD). Dogs can get one of two types of IDD, one occurring in younger dogs, the other more frequent in senior dogs. A Chihuahua's back has disks that cushion typical spinal pressure. When one of these discs fails (or 'slips'), the Chi experiences severe pain. Your dog's vet may also call this a 'slipped disc’ or 'disc disease.' Though humans have different anatomy than dogs, we can also suffer from slipped discs. Chihuahuas can't talk, so your dog's veterinarian must examine the dog and conduct tests to see how severely she is affected by a slipped disc. Tests can involve pinching your dog's paw and lightly touching his spine. Dogs can also get CAT Scans and MRIs to determine the extent of the injuries. Vets often prescribe medication to assist in the treatment of IDD. Your vet will also ask you to minimize your dog's movement, specifically jumping, and will have you confine your dog to a crate. It's hard to stop a Chihuahua from being a Chihuahua, and you don't want to change the spirit or personality of a dog. However, you can prevent back problems by minimizing the amount of jumping your dog has to do. Important note: The author is not a veterinary professional. If you feel that your dog is in pain, consult a professional immediately. Does your dog have back issues? Please add your tips below. Dogs behave differently than we do, so it's only natural that we show concern when our dogs attempt to make friends with other dogs. This can be a particularly daunting task for Chihuahua owners, as Chihuahuas are a small and fragile breed. When in a dog park, it's best to begin on a leash for safety. Once your dog feels comfortable, you can let her off-leash in permitted areas. 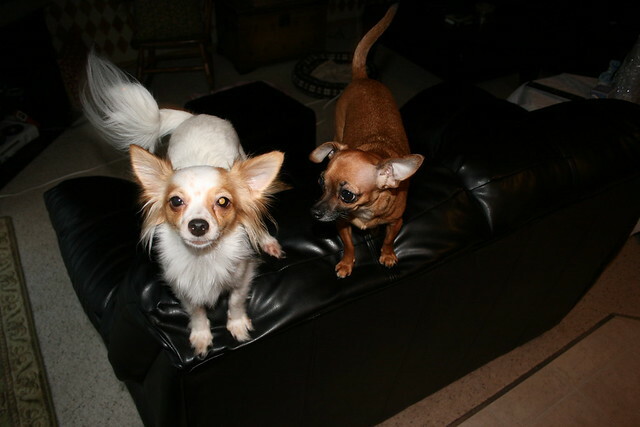 If your Chihuahua hasn't socialized with others since his litter, start by introducing him to a small, calm dog. At the dog park, you have the advantage of working things out with other dog owners, and you'll likely find many pet owners who want to help you. Allow the dogs to properly greet each other on the ground. Dogs have their own set of manners and socialization and sometimes it takes a minute before they know how to regard each other. Remain near your Chihuahua to provide assistance when necessary. Most dog trainers recommend introducing dogs on neutral territory, or areas not 'owned' or occupied by either dog. This can happen on a walk outside of the home. A walk also allows the dogs a chance to mentally focus on something else prior to the meeting. Consider spaying or neutering your Chihuahua. This can aid in overall good temperament and can also eliminate tension during a dog-to-dog introduction. When two 'new friends' are unsupervised in one location, it's always best to crate them individually. This will prevent any fights or negative behaviors. It's also best practice for pet safety when you are out of the home. Note: The author is not a professional dog trainer. Please consult a dog trainer or veterinarian prior to socializing your dog.